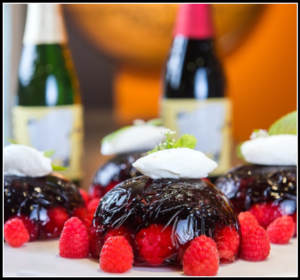 Image of Aspic of Berries with Fruited Lambic Jelly and Whipped Cream taken for the Beer Institute. Recipe was created by Chef Laurent Aubel. In a medium sauce pan put 2 cups of Lambic, add the sugar and heat to boiling point then remove from the heat. If you are using gelatin sheet, soak in very cold water until soft, then remove the sheet from the water. Add soaked gelatin sheets into the hot Lambic. Stir until the sheets are completely dissolved. Then add the remaining Lambic to the mixture. 1/3 of inch mixture into the terrine, Place in the fridge until firm. Then start to build your terrine by layering the berries by fruit. When the terrine is full add the remaining mixture and placed in to the fridge for 24 hours. In a medium mixing bowl, pour in heavy cream and powdered sugar, whisk on medium-to-high speed until a nice thick creamy texture. To serve, garnish with extra fruit and mint leaves.